1. Carefully peel the pineapple and remove the ‘eyes’. Using a sharp knife, cut across the pineapple, as thinly as possible, to create round slices. 2. Arrange the slices on a serving platter and sprinkle with the ginger, lime zest and juice. To allow the flavours to marinate, chill in the fridge for an hour or until ready to serve. 3. Divide between plates and top each serving with a spoonful of fromage frais. 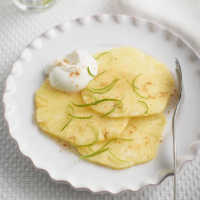 For a variation on this dessert, try dressing other sliced tropical fruit, such as mango and papaya with lime and ginger. Any leftover marinated fruit can be whizzed up in a blender with some apple juice and a spoonful of natural yogurt to make a delicious smoothie.